Remember the childhood exhilaration of opening a fresh box of crayons and seeing forty eight hues of possibility laid out before you? That's how my wife chose to describe the feeling she got when we wandered into Costa Farms' remarkable trial gardens, and I couldn't agree more. 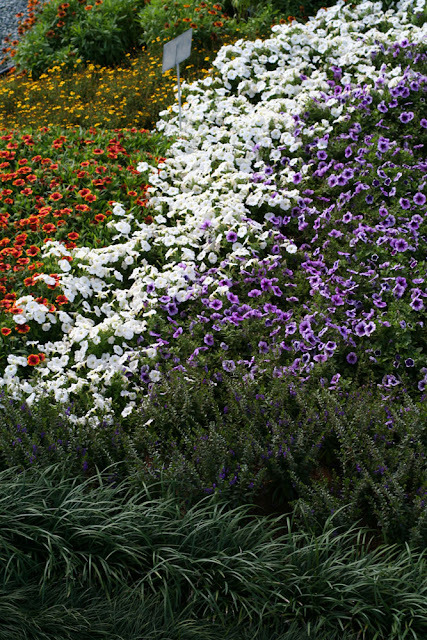 The Costa Farms trial gardens have recently expanded to two gorgeous acres filled with long rows of plants in testing mode along with idea gardens that show off some of the most creative ways to color outside the lines and show off your colors. Our 'hostesses with the mostest' were Angelica Cretu and Melissa Arteaga-Marti, who patiently tried to reign in our attention spans with fascinating facts while our eyes darted between walls of woolly pockets and forests of hanging baskets. 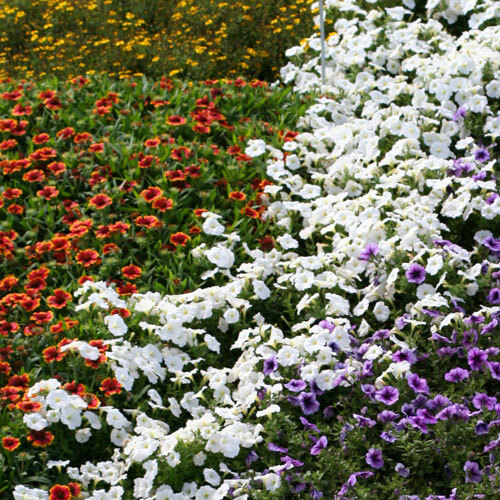 From the minute we stepped beneath the petunia draped pergola, a tapestry of color unfolded before our eyes. Angelica's soft and relaxing voice faded to static as I caught glimpses of curving beds and rows of flowers between the posts of the archway. It was fascinating to learn that they were trialing 384 petunias, but I just couldn't seem to take my eyes off the petunias themselves. 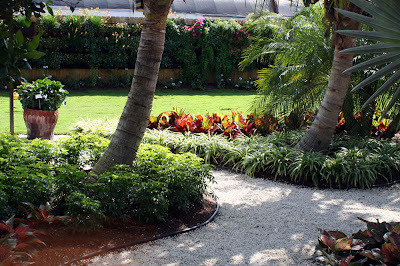 The landscape beds were a curving riot of color beneath the palms and Norfolk Island pines. These trees presumably act as windbreaks and break up the landscape's design without casting too much shade on the sun loving annuals. To get the best vantage point, Angelica guided us up into a white observation deck that offered us a sweeping vista of hues. Directly below us we could see the Burle-Marxe-esque paintings of undulating and dancing beds, and straight out we could see thousands of annuals in one breathtaking view. I wanted to have a picnic up there; any excuse to bask in the artistry for a little more time. Actually, we were getting hungry anyways. Petunias and other annuals prepare to cascade down from the pergola. I love how they incorporated the glowing orange bulbine into this vertical garden. Hanging baskets on trial to show which plants cope respond best to being airborne. There were tons of ideas to get our creative juices going, from designer arranged container combos to a hanging garden of petunia planted baskets. 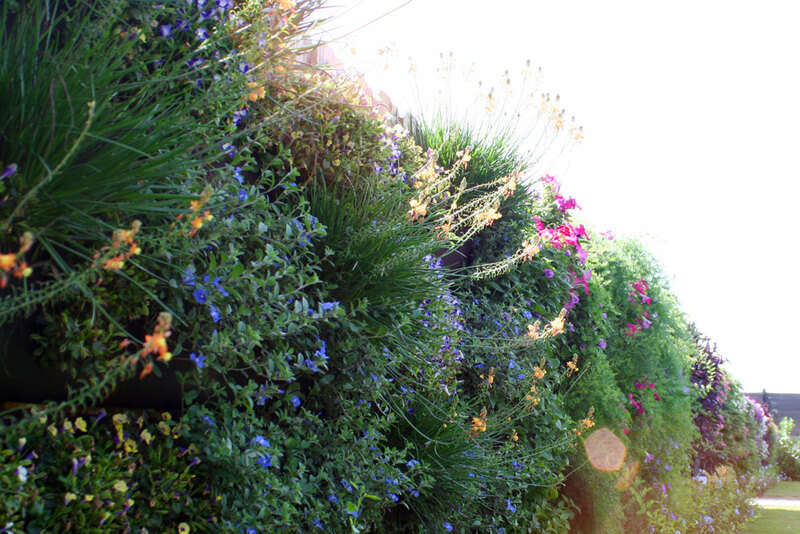 I was especially smitten with the vertical garden, which was made up of Woolly Pockets filled with annuals and tough perennials like bulbine and purple heart. 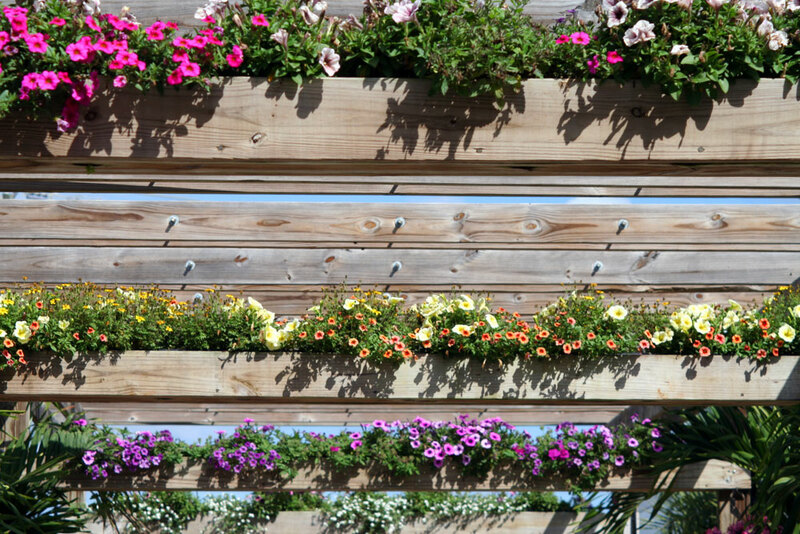 As many of you know, I am all about vertical gardening, especially when they're done well. I absolutely love these pavers interplanted with succulents, and from what I can tell, so does everyone else. 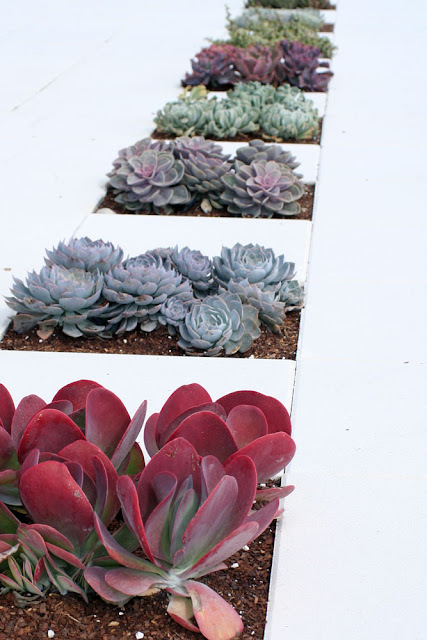 I've tried this on a much smaller scale with bromeliads, but now I want to try it again! Even though Costa Farms has managed to knock my socks off with their bedding plant displays, I'm a tropical foliage lover at heart. I was thrilled to discover a grove of feathery palms with orchids pinned to the trunks, growing epiphytically. 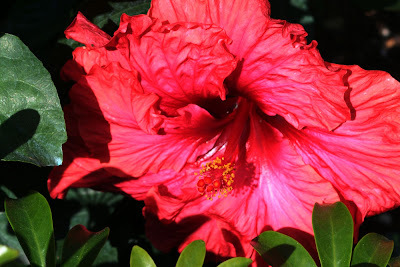 The grove was underplanted with masses of gorgeous red Aglaonemas, but what really got me excited were the hibiscus varieties. These were the kinds that you normally don't see outside specialty dealers; one had huge red flowers with a spiraling crinkled texture, and another one had lavender double flowered blooms! The best part is that they'll be available at a big box retailer near you in just a couple of months. Another tropical plant that really caught my eye is Pick Me Pink, a new cross between a poinsettia and another euphorbia. 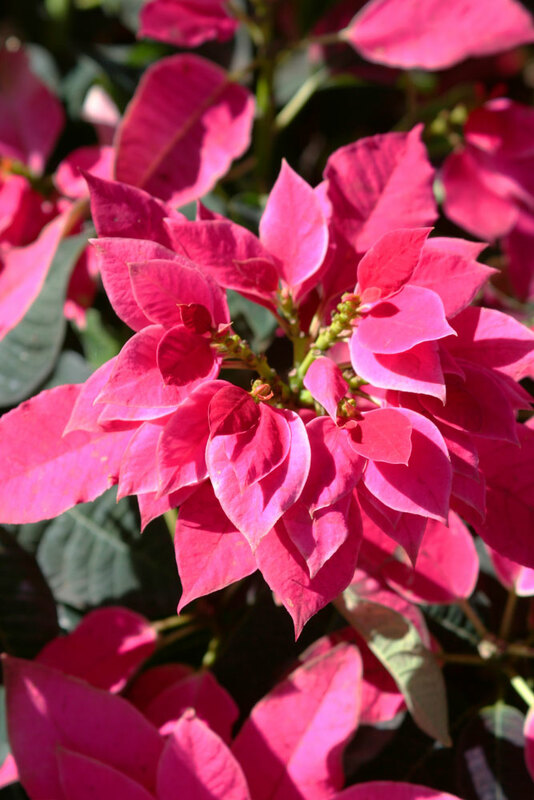 The compact habit would make it useful for tight spaces, but mostly I love the tightly spiraling bracts that fade from red to light pink. I really hope that this one catches on this holiday season. 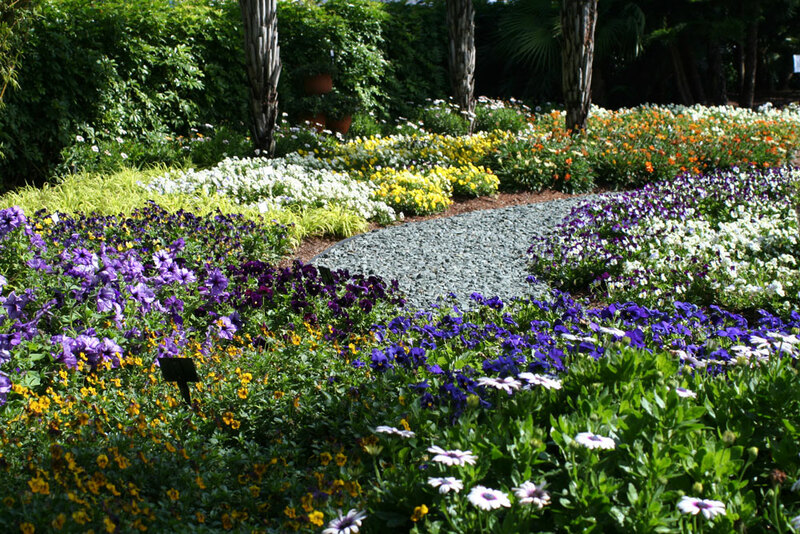 The mild winters of south Florida are ideal for growing many of the same annuals and perennials grown in spring up north. 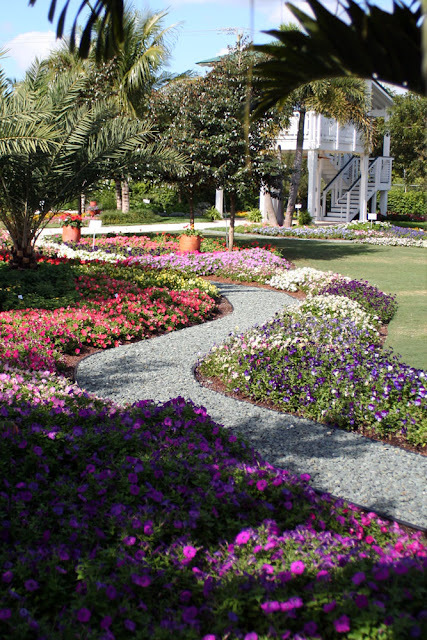 Here in Florida we call these flowers 'winter annuals,' and these are what they plant in their Season Premier trial garden. 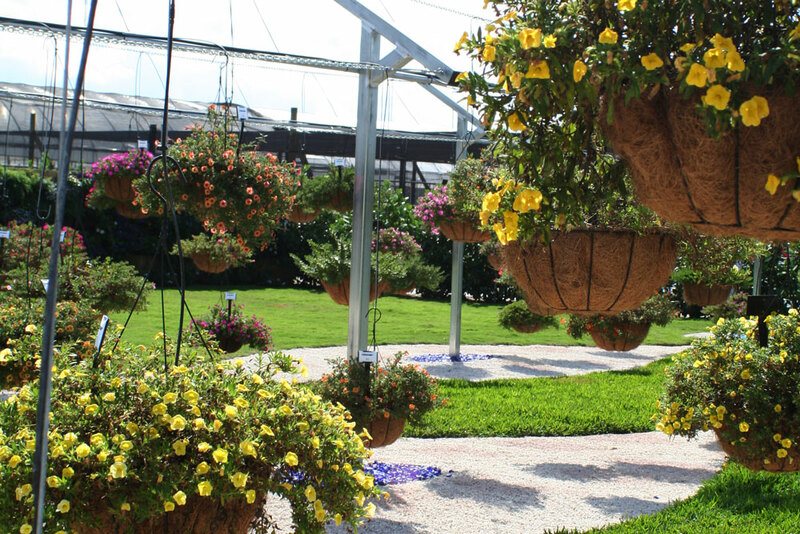 They transplant the flowers into their new homes in early November, and follow up on their progress in January, March and May. As we walked the rows of plants on trial, it was clear that several were 'dead men walking' and wilting in the heat of the day. 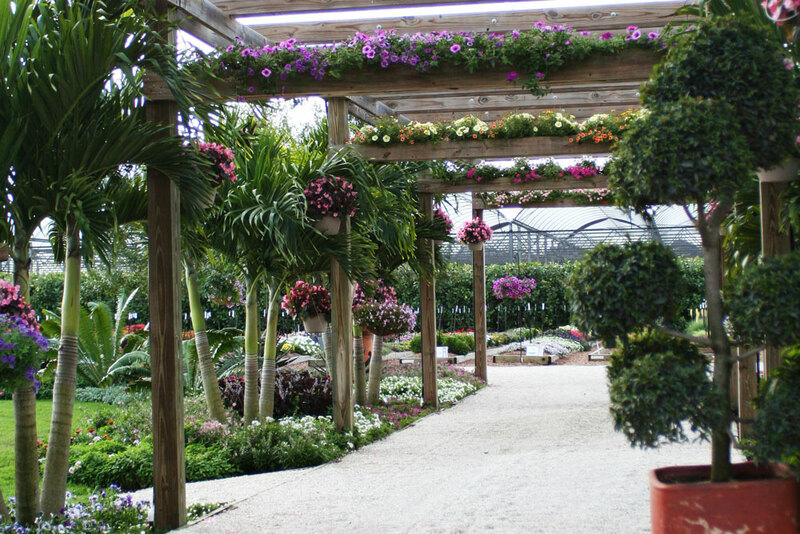 On the other hand, many of the plants were so healthy that their leaves were obscured by a profusion of blooms. By the end of May, the Season Premier trial garden is dismantled to make way for the Summer Garden. 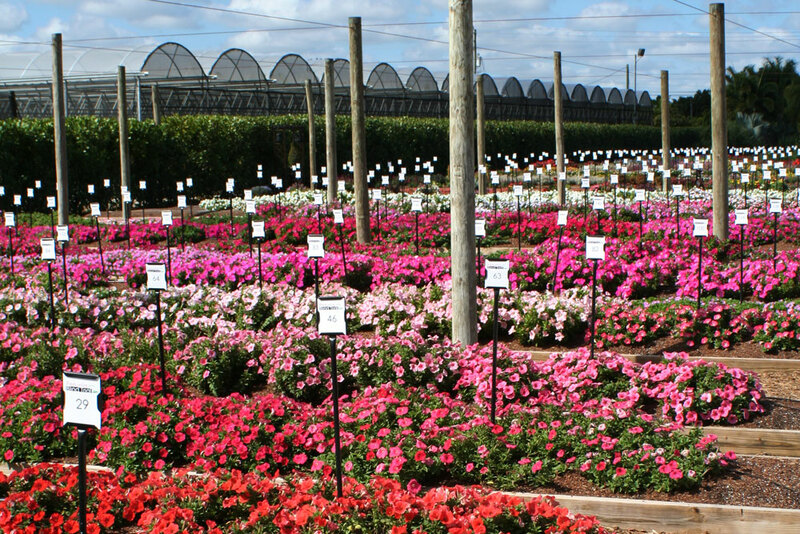 In case you didn't know it, Florida summers are rough on all but the toughest bedding plants. The sun here in lower latitudes hits the garden at a brutally direct angle in summer, and the humidity and heavy rains also take their toll. These trials aren't just limited to their grounds in Florida and North Carolina. 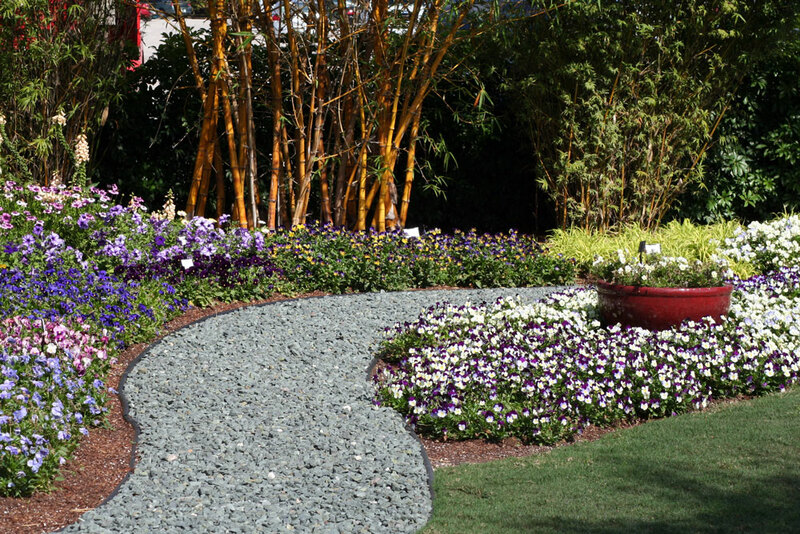 Costa routinely sends plants to garden writers to test out in their own unique gardens. 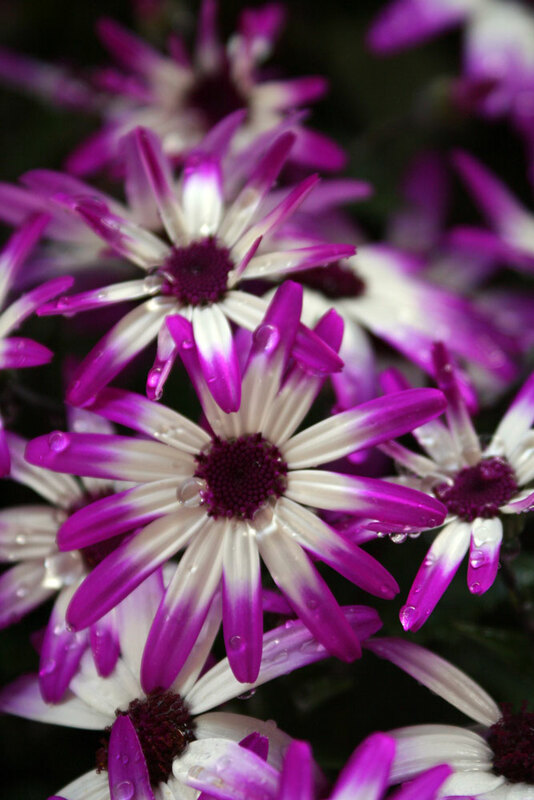 For example some other writers and myself are currently testing out their Senetti, a line of Pericallis hybrids created in Japan by Suntory. 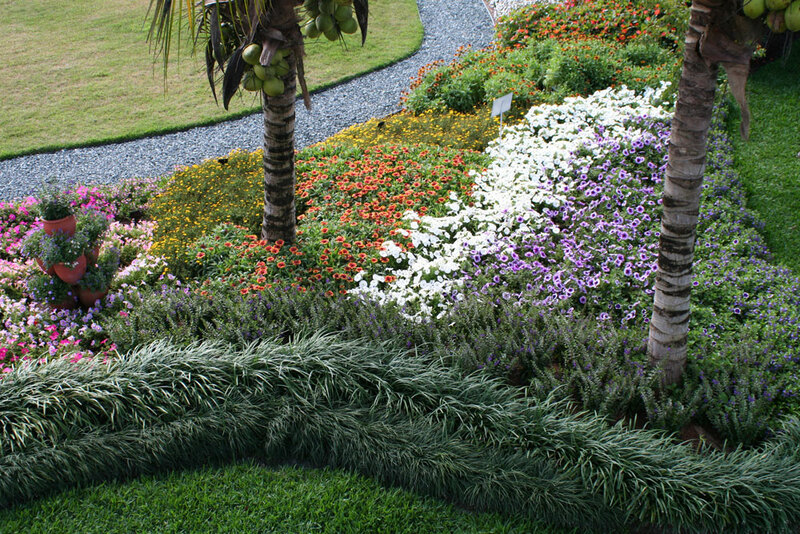 The photo barely does these plants justice, but they're verging on flourescent, in hues of magenta and deep violet, in solid colors or with bursts of white in the centers. I'll be sure to let you know how they do, but so far, so good! I wish I lived closer by! Fabulous place. 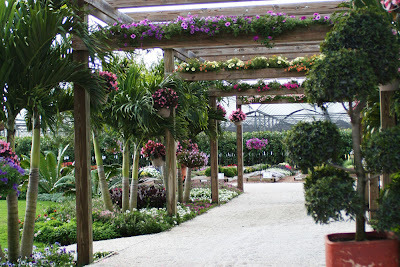 The pavers with succulents planted amongst them really caught my eye, and the Petunias cascading from the pergola beams. I could try that one myself. 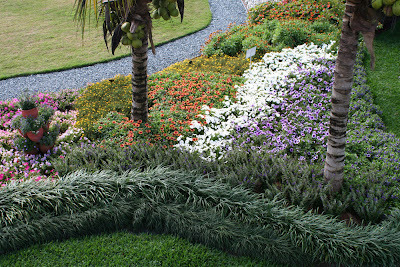 The meandering beds were fabulous, but that vertical garden was magnificent. Thanks for sharing your photos. That was fun! 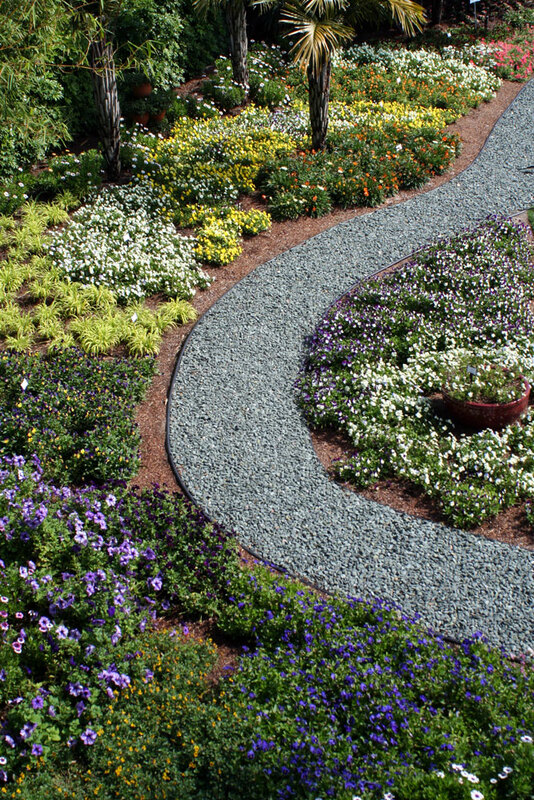 I like it all, but I think I'm with you on those succulents between square pavers. That's very cool. 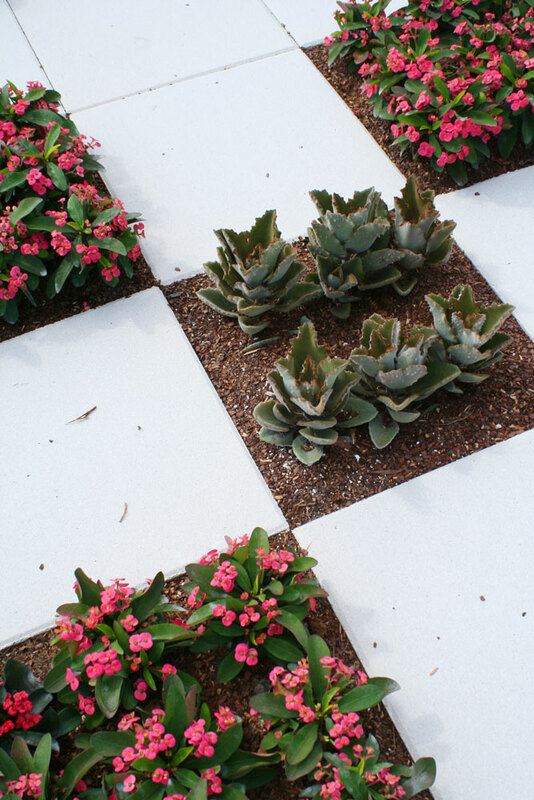 I love the succulents between the square pavers!! 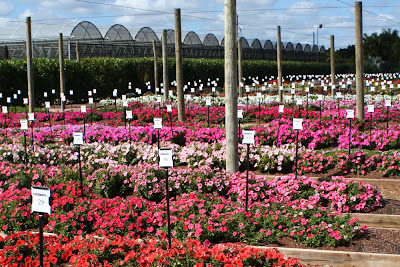 What a huge collection of petunias. I love those winding trails. They make me want to follow where they lead to. This must have taken them a while to come up with something as spectacular as this. I understand that the developing process can be unnerving (something most plant lovers don't mind anyway) , but I can only imagine the ordeal of keeping these pieces together. Must be an expensive maintenance. Lovely photos.